A short story based on an actual experience. The Bitsy Discord as seen by me/some rando/a robot/an alien. A Bongo Cat you can play with. 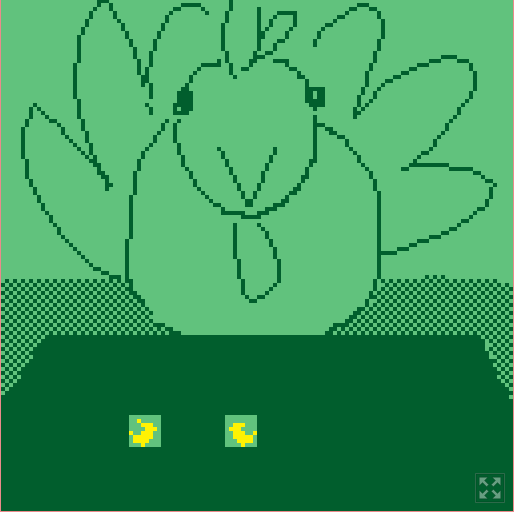 Made in Bitsy. A whimsical, whiskery adventure using the minimalist Bitsy game engine. hee hee, it's such a simple concept about such a simple sequence of a game (the good ol' main menu), but you really squeezed a lot of hilarity out of it! I'm a real sucker for word play, and this game had that in spades! That and little jabs at game cliches! What was that floating question mark? Was it just a floating question mark....? Congratulations on your 1 year Bitsyversary!! 10 cats out of 10! What a sweet little story! With a very soft and sweet song too, a song of long nights gazing at the moon, anticipating even the tiniest correspondence from a sweetheart! I liked the little pictures that were added to the screen as it went. Why not take a picture of a pizza, they don't last long anyways, omnomnomnom! Congratulations on your first bitsy! I like the night sky you made, and the funny underwater critters! Was the game just 2 screens? Maybe we're all trapped in some kind of box that is the universe....??? Is it read as one word, "bevil", or is it "b-evil"? I'm guessing the latter. nope, Bevil is a nano. wow, #20, thenix, I thought at first they looked like a guy doing pull-ups but thought that didn't make sense and that there are many ways to interpret sprites and was probably a squid of some sort. Turns out I was both wrong and right. Were you really really hungry when you made these.... this is like, the fourth "seafood-type" I've come across! These are all amazing! I had lots of fun reading through them, and also got a lot of ideas (to steal :P) for sprites! I hope you had as much fun making as I did reading it! And hey, maybe they'll catch on with your kids too! Amazing game!!! Everything looks so lovely, I like how you did each of the four kingdoms! Ack! Why did I have to keep touching the thing that said "do not touch"!?!?! Also, secret bonus points for fitting in not only torts, sneks, and forgs, but also axls too! Nice entry! An interesting use of perspective! Ah yeah, Borksy is currently bugged and can't access the hack database at the moment, but it will be looked into over the weekend according to the creator speaking on the bitsy discord. I hope you can find time to add the transparency hack once it's fixed so your short animation will look even prettier! This is a very sweet game and I love the simple and charming art! I actually tried the com device randomly at first and got one right somehow and thought I could just wing it, but it seems like it was just a lucky pull so I went to the address book to get those friends their messages!! Quick Restrict: No "e" in text. Greek Mythos Theme [Feb 2-4] community · Posted in Emotional Journey? "Emotional Journey" is just meant as a general theme and has a pretty broad meaning, but, it in general means a character transitioning through as series different emotional/mental hardships that builds towards some final big change or realization for the character compared to how they started out. So, for example, a tragic-type journey would probably have a general series of hardships and/or mental turmoil ending in mental defeat or surrender, while a journey of self-discovery might have lots of ups and downs and revelations ending with a new sense of understanding about the world and/or about themselves. Also I'd like to say again that you can take this Jam (and the rules) as casually or as rigorously as you like, so you don't need to focus TOO hard on getting absolutely everything in. Just having an impossible choice of 3 is fine for the branching path restriction, but, for more challenge, you could also try to add one extra layer to it for the "emotional journey" aspect, like, this choice is a build-up of something important in the characters life and will change them after they are subjected to it. I hope this answers you question, and thanks for joining the Jam!! Interesting idea. It's pretty relaxing sounding as it is now. Does the music change each time the button is pressed, or each time the whole game is loaded? This really does look and feel amazing. And you really did something interesting making a sort of point and click style adventure in bitsy! It's a really different kind of interaction than normal. It's a very sweet and charming game! It really does bring back a lot of old memories of fortunes and fads and playground antics. It's a really great jam entry! It was fun seeing the random tarot readings and their interpretations. How many of the cards did you include in your game? Simple and fun! I tried to uncover every square in case there might be some hidden message but I didn't notice one? "One can never have enough trench coats!" This game had EVERYTHING! Action, Intrigue, Laughs, Groans, A Giant Hairless Ape, Everything! Amazing game!! The art is amazing, and it's a really silly and fun story! You really did a great job with the 3 word prompts, nice present! woah, great game! And were those the themes, nostalgia, music, and arcade? Because it really hit the mark! I liked how the music was slowly added in as you played, and slowly built up! Oh! I like the strange worlds you've built from just those prompts! And congratulations on your first completed bitsy!! Amazing game present! It looks amazing, and it is an amazing little dino town! It was fun collecting all the pieces and the sweet (and a little sad) story that developed. And I'm sure we all appreciate being able to give you a little something for Christmas! Thank you for playing and enjoying and for everything!! It gives a good mysterious and otherwordly feeling! Well done!